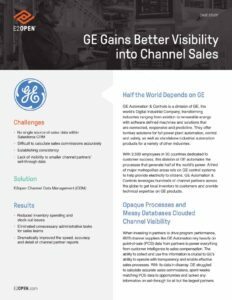 GE Gains Better Visibility into Channel Sales - E2open | Demand. Supply. Delivered. Speed and accuracy are the new currencies of quality. A timely, precise response to production variances can mean the difference between a profitable run and a total write-off — or worse, consumer injury and a recall. Today’s challenges arise not from line-level quality systems but from the fact that they are siloed, often at external partners and bridged by the slow, error-prone exchange of spreadsheets. What would it mean to your business if all quality data from your manufacturing ecosystem was automatically updated and available in one place in the cloud?